Goodness those cards are gorgeous! Using the white dauber for stripes is such a good idea - I love those cards. the watercolor look on the last one is just gorgeous. love all the cards, and same stamp but so different, even the pink one. Thanks for the great ideas! Beautiful cards! Love the white embossing on the vellum paper... elegant! Oh my! The last card using the distressed stains....GORGEOUS!!! I would love to have seen a video of that being created!! Beautiful cards!! Thanks so much for sharing!!! Thank you for showing your craft. I really enjoy the stamping and embossing techniques. Thanks to you, I have started crafting with my family who are not crafters but they are eager to participate and learn. It is evident that you truly enjoy your love for everything paper, once again thank you for sharing. The vellum is so elegant, and the watercolor with the distressing is going to have to be something I try very soon. Gorgeous! The white on vellum is so delicate!! Love all your ideas, but love the last colorful card the best! Thanks for sharing. What a great showcase of one stamp several different ways! Beautiful work! What a lovely variety of cards all from the same stamp. Beautiful! LOVE all these but that gray one wins my heart! So fabylous~ Nice gig to get to join in with too -- congrats! The many ways to use these stamps are fantastic. Very inspiring. Lovely cards! What a versatile floral stamp, perfect for any occasion. Beautiful floral designs! I especially love it on the vellum! Joan these are beautiful! Such different looks with the vellum. That last one really grabs my eye! It's beautiful in color, but the white on vellum is amazingly stunning! Thanks so much! Beautiful colorful cards...great inspiration. Hero Arts products are awesome. all 3 are just beautiful! Beautiful cards. I especially liked the vellum cards with the white embossed image. So soft and pretty. Thanks for sharing. Fun to see the different looks you get from the same stamp. Love that first card. Your cards are clean and crisp looking. Love the subtle white but also love the vibrant red get well. Joan, the vellum cards are so elegant and I'm in love with the watercolor card using the distress inks - rest assured that I'll be giving that technique a try! Thanks for sharing your talent with us Joan. Wow, Joan!!! your first two cards are just CAS perfection!!! I love the softness of the vellum. The polka dots and red accents on your third card are bring so much cheer and happiness on this grey and dreary winter day! love that stamp and what you've done with it - especially the ones on vellum over the striped paper! How élégant and classy the white stamped roses look. Gorgeous cards. Three beautiful cards! Hard to pick a favourite but the vellum makes for a very pretty soft look. These are all really pretty. I'm always, especially, drawn to tone on tone cards. Love all 3 pretty cards! Beautiful cards. You deserve to be among this talented group of designers! WOW!! I am in LOVE with the simplicity of the vellum over the light colors. Your third card with the distress ink technique is fabulous!! Stunning cards! Thanks for sharing!! Oh WOW! I love all of these. The vellum cards are so pretty. Love the dauber stripes. And, then the colored one - gorgeous!! Thanks so much. Love the delicate look of these cards!!! I love how you got so many different looks from one stamp. Beautiful! Joan, your cards are magnificent...LOVE them ALL! Such beautiful cards, Joan! I have always loved the look of white embossing on vellum but the card made with distress stains is eye-popping too. Love how you did all the cards each is so different but the same. Such different cards from the same stamp - thanks for the inspiration. Can't help it...I thought of beautiful night gowns with your first 2 cards. Then, Pow! Your dramatic red card. Love them all! Oh, so beautiful! I love all the cards - the beauty of the cards is so different in each case! The Antique Rose stem is a great stamp. I really like the bright inks you chose for your final card of the 3 posted! Your cards are lovely. Your vellum cards are my favorites. Beautiful cards. I really love the colors on that last one! The rose is beautiful...a must have. My wish list continues to grow! Two very different looks from 1 stamp! Gorgeous - absolutely gorgeous. Love the white on white especially. Wow, awesome cards! Thanks so much for sharing. Awesome cards, I absolutely love the white embossing on the vellum! I love your dauber striped background and I love how soft your last card is! Stunning cards! I really love the white one! Love all these different looks with one fabulous stamp, gorgeous cards! Those are so delicate and pretty, especially the white one on Vellum. I really admire all the beautiful work you bloggers did for the hop. I hope my work will be just as beautiful. Your cards re so lovely! Your use with the vellum is just uber classy. I love it. TFS! It is amazing how the same stamp can look so different depending on the technique and medium used. I love all these cards. I thought you had me at pink but that last one is really beautiful! BEAUTIFUL embossed vellum technique! I love this look! Love both the looks your created with this stamp - but I think I'll try the Distress ink technique first. I am just in AWE... of your beautiful and gorgeous cards!!! Oh wow what gorgeous cards! that first card is breathtaking! Beautiful cards - thanks for showing such different ways to use this gorgeous stamp! Fab showcase demonstrating a stamp versatility thanks for sharing. wow! love that last card the most!! what a beautiful stamp!! Joan, your cards are all lovely, and I especially love the pink one. Beautiful work. Love the stamp and your cards. Especially the pink one, but then and again it's pink! Love your cards, the white one is esp. great. Thanks for sharing. Joan, these are absolutely lovely--beautiful work! Both options of this card are beautiful! The first one with the white embossing is so refined and elegant where the other really brings pop with the colorful elements. Nice job! I like them all, but the watercolor card is my absolute favorite. I love the colors. Such a beautiful stamp... stunning cards. Cheers. Your cards are beautiful and clean and elegant. Love them. Wow. Absolutely simple and gorgeous. All 3 are fab! I'm especially drawn to the no-line watercolor! Wonderful cards using this very pretty flower. Embossing on velum is so elegant. Wonderful cards. Oh! What gorgeous cards! Absolutely stunning! the first card would make a wonderful wedding card. the second is so bright and colorful. Great use of that stamp set. I love when I can think of many ways to use the same stamp set. Love the white on the grey card(elegant) and the pink card(also elegant) and the watercolor look card(because I love watercolor). The stamp is one of my favorites from the new release. These are all absolutely amazing!! Beautiful cards!Hero Arts stamps are awesome! Absolutely beautiful. Love that you did a few cards with the same stamps and showed the variety you can get. Thanks! Lovely cards!! Thanks for sharing and inspiring! Great techniques! Love your cards. Your cards are so very pretty! Love the vellum over the stripes! All so elegant. That flower looks fabulous on the vellum. And the watercolor-y card to gorgeous. Very pretty cards! Lovely new rose stamp! These are very pretty! I love the white on white version! Beautiful ways to use that stamp!! Love the tone on tone! Very inspiring! Beautiful cards. THis is one of my favorite stamps from the new catalog! Such classic looks! Thanks for sharing! So pretty! I LOVE the flower stamped on the vellum!! Thanks for sharing the great technique. Lovely cards!!! Gorgeous cards. I love how the distress inks worked out. Thanks for the hop! Beautiful embossing! Love Hero Arts products. Thanks for sharing! Nice addition to the hop. Oh I really like the vellum one! Such lovely cards. I am really taken with the white dauber stripes. Lovely, lovely stamp and lovely, lovely cards! Like the white embossing on vellum. Fantastic!!! That antique rose is simply beautiful!!!! I can't decide which I like best ... so I vote for them all. Lovely cards! Love them all! Absolutely beautiful cards! Love the softness on the first cards and love the red on the last card! Thanks so much for sharing! Beautiful cards. 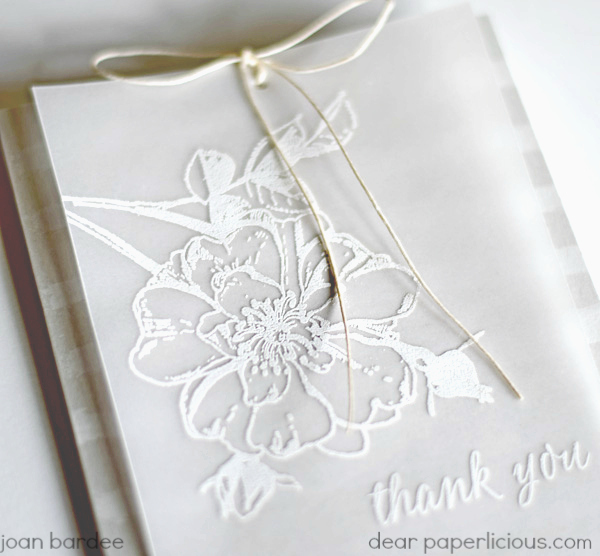 I love embossing on vellum, it just makes the card seem so elegant. Wow...what a great example of how one stamp can be used for completely different looks! Lovely floral cards! So gorgeous with both the embossing and the watercoloring! Great stamp! I love how each card is unique! Really lovely, Joan! Gorgeous projects! Wow...this is really great! Love the cards you did! What a great idea to make stripes with a dauber! Love all of these gorgeous cards. Thanks so much for the tips! Love this and totally beautiful. Love the watercoloring. I love the variety of looks you got from the same stamp set. The first one is my favorite - so simple but so gorgeous! Such beautifully contrasting cards made from the same stamps - wow! LOVE the vellum card! I also love how you made the stamp look so differently on the cards. I love how you used the same stamp in 3 different ways it is very inspiring and helpful for me as I am fairly new to card making. All 3 cards are beautiful! I was blown away by your first card but then kept seeing the other cards and was just as blown away by those! Awesome work!!!! Very elegant, I love the delicate look. These are so lovely! The soft look on the two first cards is awesome! Lovely rose cards. I like the different looks you achieved. So pretty and great to remind us not to get hung up using one color group for a stamp! Love these pretty classy cards! The get well soon card is amazing! Beautiful cards! Cool look with the vellum! I love all your cards. The last one is very special. The blog hop has been so much fun and I am learning so much! So beautiful! I love the pretty colors and flowers. Thanks for sharing. Your cards are gorgeous--love the white on white and pink on pink, so pretty! I must do some watercolor look cards! Great card ideas. Thank you! Oh my goodness. These cards are so beautiful. Love anything on vellum. But this flower stamp is gorgeous. I also like the white-on-white. And the watercolor card...so very pretty. Aweeee....little bits of Heaven right here! All three are gorgeous! I love to see how to stretch one stamp!!! 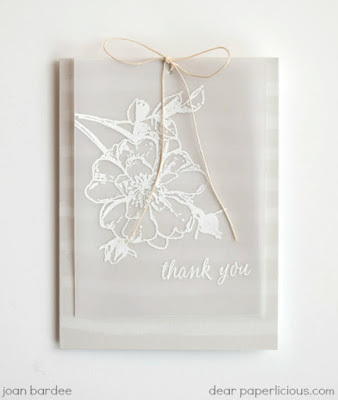 The grey & white with vellum flower Wow! My favorite on the hop. Both cards are lovely...really like the second with the watercolor technique. Love that flower with the distress stains! Beautiful! Lovely cards and great inspiration. Spectacular idea. I really want to try this. Awesome cards. The white and pink ones took my breath away. Like the look of the vellum. Have a BEE-utiful day! Very pretty cards. 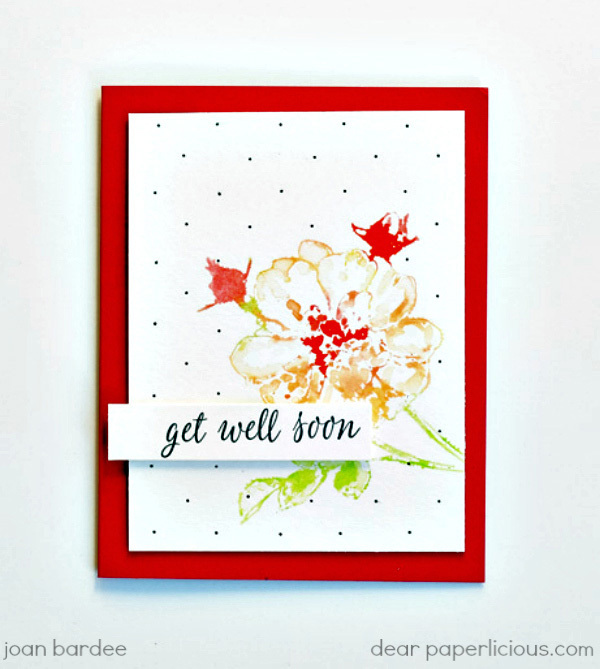 I'm especially fond of the bright red get well card. 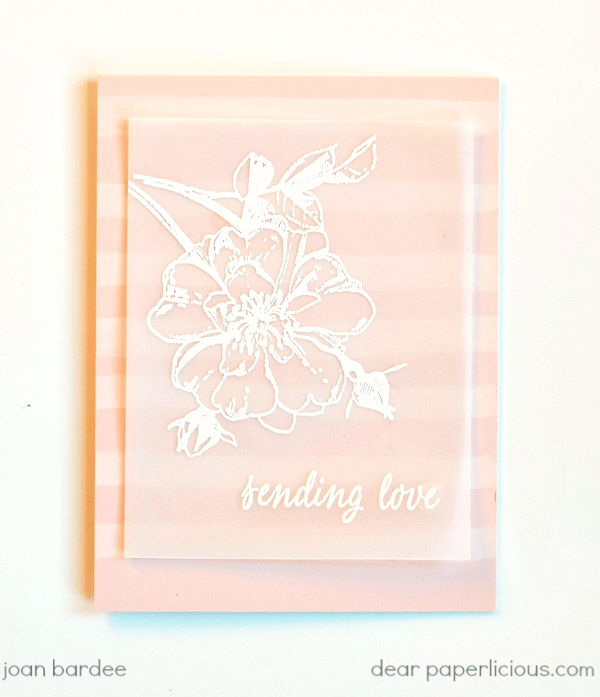 The antique rose stamp is lovely stamped in Distress inks! Simply gorgeous!!! All the cards are wonderful. Thanks for sharing! such a lovely couple of cards. 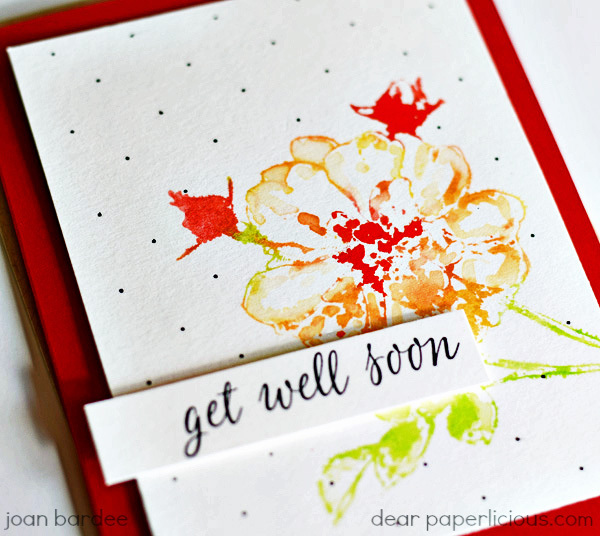 Both cards are beautiful but the get well card really pops with the color. Thanks for sharing.